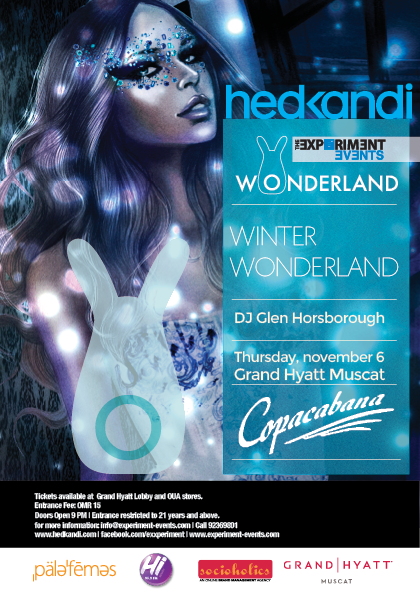 This coming weekend see's the return of the Wonderland party with Hed Kandi providing the aural entertainment down at the Copacabana. The super nice guys at The Experiment have given me a pair of tickets to giveaway which some of you have entered into for a chance to win. The lucky winner is "gpirkko" check your email for details on how to claim your tickets! For the rest of you, tickets are RO 15 a pop and can be purchased from the Grand Hyatt Lobby from 11am - 8pm, or for VIP booking contact 9236 9801. Some of you may not know, but the Copa has an amazing VIP lounge that over-looks the dance floor, its pretty nice in there. There is a facebook event page here, which has updated information about the event. There is a tag for Twitter and Instagram, #WonderlandMuscat if you attending the event and want to connect with others!